If you could build a bulletproof workfile that increases your value as an appraiser and insulates you from liability, you would build it, wouldn’t you? Now you can. 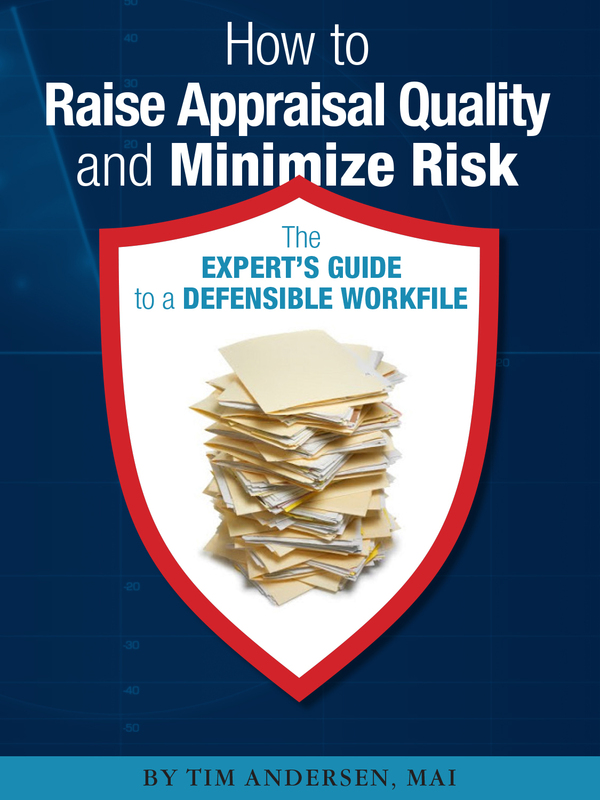 The NEW 2016 Expert’s Guide To A Defensible Workfile- How to Raise Appraisal Quality and Minimize Risk, is ready for you now! Do you have the proper support for every adjustment, every claim, and each conclusion in your appraisal? In today’s climate, you’d better. As many appraisers are finding out the hard way, even if the value conclusion is correct, if your appraisal report comes under the microscope, every “i” must be dotted and “t” crossed in order to escape trouble. The NEW 2016 Expert’s Guide to a Defensible Workfile shows you how to “bulletproof” your workfile and protect your appraisal license and livelihood. Timothy C. Andersen, MAI, AQB-Certified USPAP Instructor & Consultant, takes you step-by-step, and in plain English, through the items that must be included in every Workfile, as well as the items that are often omitted. Andersen unravels USPAP to show you what you need to know to protect yourself. With extensive experience as a USPAP expert in cases involving appraisal litigation and state board complaints, Andersen shows you how to ensure your workfile is complete so that when irate clients, state appraisal boards, and raging plaintiffs come after you, you’ll be ready and protected. A bulletproof workfile is your best defense. New lending and appraisal regulations make it easier for borrowers, sellers and clients to file charges against appraisers in court, with their state appraisal boards, and with any professional organizations the appraiser may belong to. This Guide shows you what you need to know to defend your appraisal, raise your appraisal quality and minimize your risk. *** Please note this product is a Digital Book (PDF format) only.